v. The reactionary invasion of Yemen by Saudi Arabia and the UAE, with the support of Western imperialism. i. 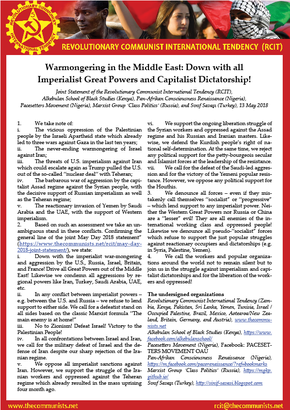 Down with the imperialist war-mongering and aggression by the U.S., Russia, Israel, Britain, and France! Drive all Great Powers out of the Middle East! Likewise we condemn all aggressions by regional powers like Iran, Turkey, Saudi Arabia, UAE, etc. iv. In all confrontations between Israel and Iran, we call for the military defeat of Israel and the defense of Iran despite our sharp rejection of the Iranian regime. v. We oppose all imperialist sanctions against Iran. However, we support the struggle of the Iranian workers and oppressed against the Teheran regime which already resulted in the mass uprising four month ago. vi. We support the ongoing liberation struggle of the Syrian workers and oppressed against the Assad regime and his Russian and Iranian masters. Likewise, we defend the Kurdish people’s right of national self-determination. At the same time, we reject any political support for the petty-bourgeois secular and Islamist forces at the leadership of the resistance. 3. We denounce all forces – even if they mistakenly call themselves “socialist” or “progressive” – which lend support to any imperialist power. Neither the Western Great Powers nor Russia or China are a “lesser” evil! They are all enemies of the international working class and oppressed people! Likewise we denounce all pseudo-“socialist” forces which refuse to support the just popular struggles against reactionary occupiers and dictatorships (e.g. in Syria, Palestine, Yemen). 4. We call the workers and popular organizations around the world not to remain silent but to join us in the struggle against imperialism and capitalist dictatorships and for the liberation of the workers and oppressed!